« 5 Ways to Wear Leather Pants Without Looking Like a Delinquent: Spot-On Celebrity Styling to Copy! We have all had moments when we are oh-so-comfortably nestled on our couches while wearing our favorite pajamas and enjoying a moment of low-brain-activity television. Suddenly, we are asked to make a run to the grocery store or perhaps to do an errand that we forgot to finish earlier in our chaotic day; dressing up feels like such a pain when in this state of relaxation. Go ahead; grab those sneakers and jeans. We’ll show you five throw-on-and-go outfits that won’t sacrifice style for comfort. 1. Go menswear all the way. The items needed in this look need not be ironed (though we do encourage ladies to be tidy, stuff strewn across your bed and floor will do). Grab a pair of boyfriend jeans and sneakers. Wear them with a plain tee, and throw a plaid shirt over it. 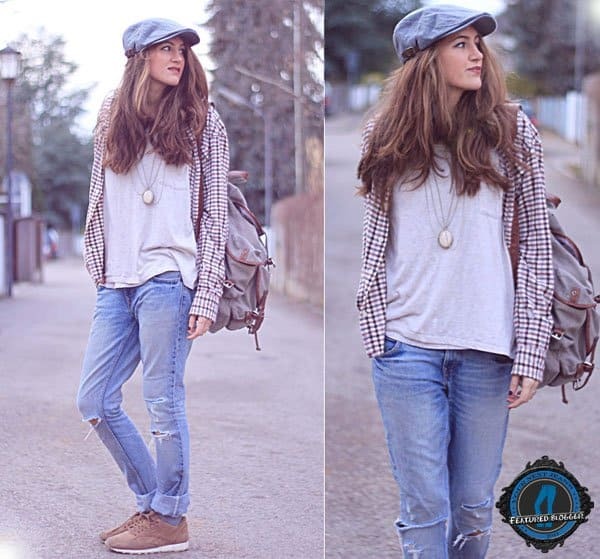 A quick necklace, a backpack, and a hat will nicely polish off this look. 2. Don’t be afraid to mix masculine and feminine. Grab an edgy acid-wash pair of denims, and wear them with New Balance sneakers. Play up the masculinity of this look with a beanie, but don’t be afraid to contrast it with a fluffy baby pink coat or jacket. Play with other feminine elements, such as an oversized tote, or simply let your long tresses loose in gorgeous waves. Surprisingly, a look that is meant for a pair of pointed-toe heels will also work with sneakers. 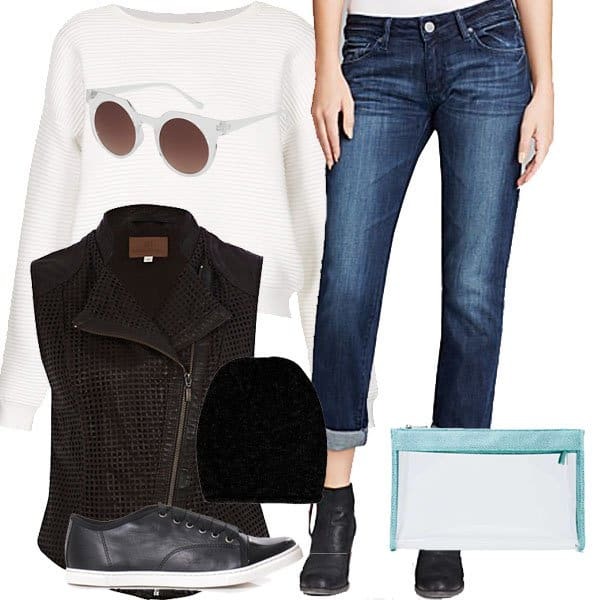 Wear mom or boyfriend jeans with a turtleneck top, and lavish yourself with sophistication by throwing on an oversized coat and an infinity scarf (just make sure that your ankles can actually be seen to cut off the part where your frumpy mom jeans meet your sneakers). Grab a clutch, and put on some reflector sunglasses. We imagine that this is what Victoria Beckham would wear while out jogging. 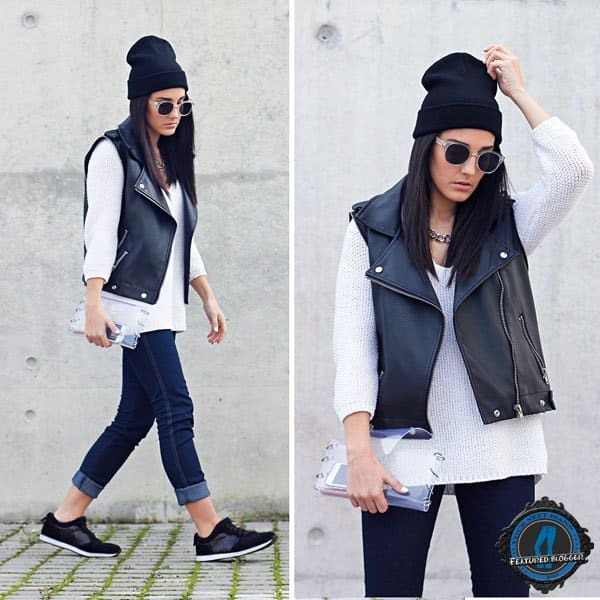 Leather has an uncanny ability to dress up pretty much everything that it is paired with, and the jeans-and-sneakers combination is no exemption. Go with a full leather jacket, sunnies, and a clutch for a more feminine feel, or grab a leather vest, a beanie, and a backpack to steer your look more toward androgyny. 5. Play with bold colors and prints. How do you keep people from realizing that you are wearing yesterday’s clothes? Why, distract them, of course. Nothing can take their attention away from a neutral pair of jeans and sneakers than loud animal prints (such as an oversized leopard trench) worn with a hot pink beanie. Get plus points for putting on an adorable set of frames.